A year ago, I was called upon to defend a grant application for a writing retreat. The retreat was to be hosted by The Door of Hope Writing Group, which I lead. 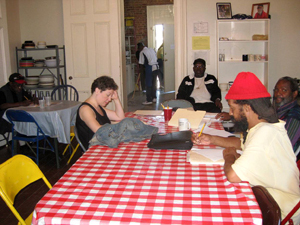 Our group is made up of men and women who have known chronic homelessness, and those who still do. The grant review panel did not want to hear about the proposed retreat. They wanted to know why on earth we were teaching writing to the homeless. The writing group meeting at Door of Hope. Over the three years we’ve held writing group, I’ve noticed a pattern. Writers tend to write with us when they first sign on with the Door of Hope. As they transition into housing, the writers often move on. I miss them when they are gone. Or they stay—they fall in love with writing and they keep coming after they have homes of their own. This year, when I went to defend our grant application to expand The Advocate to a city-wide, monthly online publication known as The Advocate: The Voice of Experience, no one asked me why on earth we were offering writing to men and women who have known homelessness. They just asked that we make sure the public would have an opportunity to experience what we are doing at the writing group. That’s a concern we had no problem answering. Ellen Morris Prewitt writes and teaches in Memphis, Tenn.